Following up on Bob Schoone-Jongen’s reflections about the outbreak of World War I, I thought I’d pass along mine on some classic memoirs and novels that came out of the war.The following doesn’t pretend to be a definitive list of greatest hits; more of what I’ve been sampling by way of book orders for teaching next fall. I posted this originally on The 12, and in the archives there you can read, if you’re interested, my own musings about the forces and crisis that led to the coming of the war. I started, as one must, with Erich Maria Remarque’s All Quiet on the Western Front. I probably first read this book some fifty years ago and so was a bit bemused, this time, by its mundane and nonchalant opening chapters. The wartime action picks up soon enough, though, and reminds you of why this book has left such an impression over the years. You feel what trench warfare was like, especially the intense shelling—but then also the threat of death, and tedium, everlasting. One by one the narrator’s friends (they went into the army together, fresh out of school) fall to fates bizarre or banal. In the process Remarque brings out strongly the one theme common to all these books—the overwhelming sense of loyalty to the mates in one’s unit. All the home-front bluster and sentimentality, all the idiocy of high command, all the fickleness of fate—over against all of it, only the bonds of shared hardship, survival, wicked humor, and crushing love are real, can endure. From All Quiet (1929) I moved on to The Road Back (1931), Remarque’s sequel in which he explores how battle-weary veterans adjusted (or not) to civilian life. The story is necessarily not as dramatic as that of the trenches, but no less precise and poignant in its depiction of how a war-weary and defeated society either could not or did not care to understand the bedraggled survivors returning from the front. (Sound familiar?) The band of brothers finds nurture only in each other. 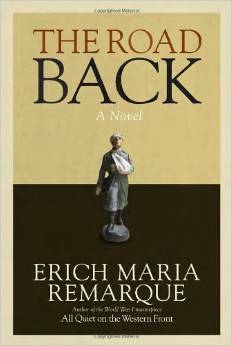 Remarque shows each of them exploring a path back to normal life, the hazards attending thereunto, and the callousness, persistent privation, profiteering, fear, and cynicism that set the tone of postwar German society. I found this book just as hard to put down as All Quiet, and ultimately sadder for its closer proximity to ordinary life as we experience it. 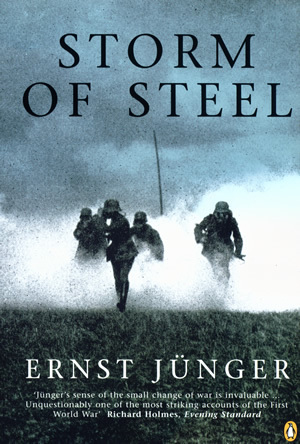 Quite by contrast, Ernst Jünger’s Storm of Steel, one of the earliest (1920) chronicles of trench warfare, was long controversial for the glorification of combat that can be inferred from it. Jünger himself was wounded often in the war, but never regretted having to return to the lines upon recovery for, as the book shows, he never felt quite so alive as under fire. Oddly, the non-combatant Remarque leaves you with a more vivid sense of battle than the four-year veteran Jünger, who renders battle action abstractly and seems more concerned to identify rival units by their number, position, and reputation than by their common experience of being shelled or surging across no-man’s-land. Personal thoughts and patriotic sentiments, on the other hand, come through with precision and verve. The book climaxes with Jünger’s exhilaration at the spring 1918 German offensive that brought them close to Paris once again. The sharp and disastrous reversals of that summer and fall he passes over obliquely, in a fog. The memoir concludes with an ode to the German nation’s irrepressible strength and resolve for future glory, and we go away knowing a little better how embittered veterans like Adolph Hitler could cultivate enthusiasm for another go at what gave their lives meaning. Check back on Tuesday for Part II of this feature, which will consider women’s experiences and memoirs of the war. Jim Bratt is professor of history at Calvin College, where he teaches courses in world and American history. The focus of his current research is American religion before the Civil War. He recently published a biography of the Dutch theologian and political leader, Abraham Kuyper, who has had an enormous influence on the history of Calvin College. Jim also blogs regularly for The Twelve: Reformed Done Daily. 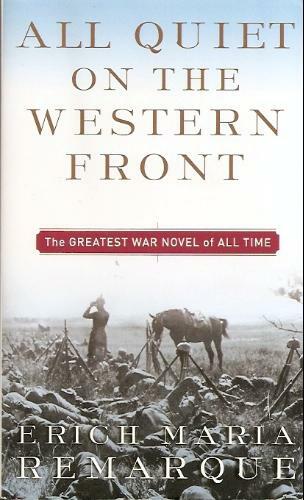 This entry was posted in Jim Bratt and tagged All Quiet on the Western Front, book note, book review, Erich Maria Remarque, Ernst Junger, memoirs, Storm of Steel, World War I. Bookmark the permalink.